2Bihar Animal Science University, Patna, India. Division of Livestock and Fisheries Management, ICAR Research Complex for Eastern Region, ICAR Parisar, P.O. B V College, Patna, India. The foot and mouth disease (FMD) is one of the most important contagious viral disease of all cloven footed animals in our country. It causes huge economic losses annually due to its endemic nature; it leads to decreased milk production in lactating animals, abortion, decreased working capabilities of draught animals, death in young animals, thereby resulting in high cost-of treatment. FMD has high morbidity in cattle especially in exotic and cross bred cattle. Therefore, early intervention in control of FMD is very important. No specific treatment is available. Supportive therapy promotes early recovery. The Government FMD control program recommends vaccination at six monthly intervals for controlling the disease. However, as there are many subtypes of virus which cause the disease, management of FMD is difficult. Foot and mouth disease (FMD) is a highly contagious viral disease of cloven hoofed domestic and wild animals. The importance of the FMD in livestock and its impact on economics lies with the fact that the virus is endemic in India and has the capacity to infect 100% of the flock population with immediate adverse impact on milk production. The policy of controlling the disease outbreak by vaccinating FMD susceptible animals twice a year through FMD Control program has not been very effective. Failure of vaccination may be attributed to short immunity period or evolution of diverse FMD viral strains in nature. The prohibition of cow slaughter in Indian culture, and the failure of agencies to implement stamping-out policies on diseased animals are other crucial factors contributing to failure of FMD vaccination. India has a FMD susceptible livestock population of 510.89 million including cattle, buffalo, pig, goat, sheep, yak, mithun, and camel, as per the 19th livestock census. According to the estimates of the Central Statistics Office (CSO), the current value of output livestock sector was about 591.691 thousand crore during 2015-16 . An estimate of the direct economic loss from FMD in bovine animals can be in tune of 15-20 thousand crores annually. This figure is self-explanatory in highlighting the impact of FMD on livestock economics. The earliest documented records by Hieronymi Fracastorii (1546) suggest that there was an outbreak of FMD in Italy, in the year 1514. Evidences of FMD in our country can be traced back to 1868. Since then FMD has been reported from all the corners of our country, year after year. Considering these, a comprehensive study has been attempted on FMD and its control measures. FMD is caused by an acid labile, non-enveloped, RNA viruse of the genus, Apthovirus and the Picronaviridae family. The FMD virus has seven serotypes (O, A, C, South African Territory (SAT) 1, 2, 3, and Asia1), of which O, A, andAsia1 are endemic in our country. The O serotype is the most common circulating FMD virus in our country. Three lineages of the O serotype: Ind 2001, PanAsia and PanAsia 2 are most frequently encountered in India . Over 60 subtypes of the virus have been identified and new subtypes continue to develop. Interestingly, these serotypes do not confer cross immunity. This is one of the important reasons underlying the difficulties in controlling FMD. The FMD viruses are relatively hardy at a pH range of 6-9. It can persist in animal feed and in the environment for up to 30 days. Common disinfectants which can be used to control the virus spread are: 3% Sodium hypochlorite (bleaching powder), 4-5% acetic acid (vinegar), 2% sodium hydroxide, and 4% sodium carbonate. The virus is resistant to iodophores and phenols. All domestic cloven-hoofed animals under the order Artiodactyl are susceptible to some degree including cattle, buffalo, pigs, sheep, and goats. Wild animals are also susceptible including all species of deer, antelope, elephant, and giraffe. Guinea pigs can be infected experimentally and are commonly used for experimental studies. Cattle are important maintenance hosts but a few FMD virus strains are adapted to pigs. Pigs are also considered as amplifier hosts as they are able to produce aerosols many times greater in virus concentration than maintenance hosts. Breed variations also exists with crossbreed and exotic animals at increased risk of FMD as compared to indigenous cattle. Similarly, species variations in severity and morbidity are observed amongst cattle and buffalo exposed to the same level of infection load under field conditions. Buffaloes are comparatively more resistant than cattle. Goats and sheep normally have a mild form of disease, which often may go unnoticed. Some species of animals (cattle, buffalo) recover from the disease and may remain carriers for weeks or years. Swine are normally not long-term carriers of Apthovirus. All age groups are susceptible to infection by the virus, though the clinical findings and sequelae may vary. The FMD virus is believed to be present in all secretions and excretions of the affected animal. Therefore, all secretions may contain the virus (Figure 1). Virus shedding begins four days before the onset of clinical signs and the highest amount of virus shedding occurs at the peak of clinical signs involving rupture of the mouth vesicles. Airborne transmissions can occur under favorable climatic conditions, with some viruses spreading over long distances, particularly over water. Figure 1: Virus transmission in FMD from clinically infected animal and outcome. The FMD virus is highly contagious and often has 100% morbidity in a susceptible population. The clinical symptoms observed are limited to foot and mouth and are epitheliotropic in nature. Foot and mouth are the most susceptible parts of the body for constant trauma and abrasion. The severity and nature of trauma varies depending on species, age, virus type, and immune status of the animals. With suitable interventions, low morbidity rates can be achieved in adult animals, with recovery occurring within 15-21 days. However, high mortality rates have been recorded in calf, piglets, and lambs. Higher mortality rates in young animals are related to virus mediated myocarditis (Figure 2). In bovine species, the first observed symptoms are in appetance to anorexia, sudden drop in milk production (>25%) along with high fever which may last up to 3-4 days. This follows vesicle formation on the tongue, dental pad, between hoofs, and the coronary band (Figures 3-5). We have observed vesicle formation in the nostrils and teats in most cross bred cattle (Figure 4). FMD results in drooling of ropy salivations from the mouth (Figure 3), constant shifting of weight (stamping and lameness), and audible smacking sounds due to repeated the movement of the buccal cavity. Later these vesicles rupture and leave behind erosions. Such affected cows starve themselves due to inability to intake food. 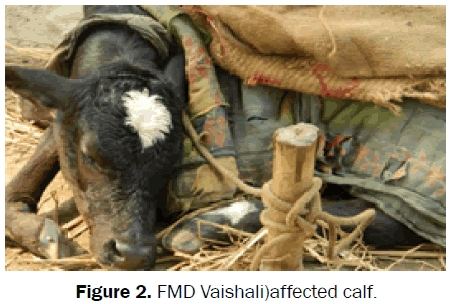 Figure 2: FMD Vaishali)affected calf. 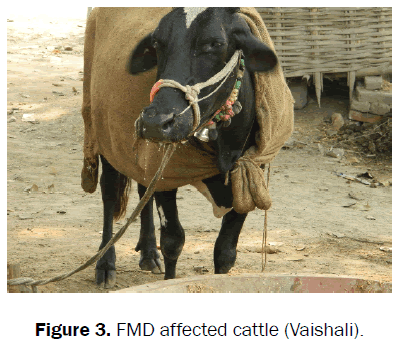 Figure 3: FMD affected cattle (Vaishali). Figure 4: Vesicle in nostril (Patna). 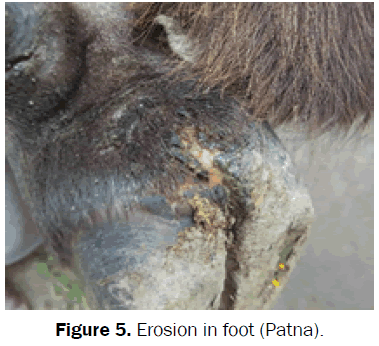 Figure 5: Erosion in foot (Patna). If erosions are not properly taken care, secondary complications occur resulting in the development of maggots in hoofs, permanent lameness, and mastitis. Other complications include myocarditis in young animals, abortions in pregnant animals, weight loss, and a few animals develop endocrinal disorders like panters with an inability to tolerate high temperatures. In sheep and goats the lesion are often mild and may get unnoticed. In pig high fever accompanied with lesions in snout, lips nostrils, foot and lameness are predominant signs. FMD is a viral disease for which there is no specific treatment. However, symptomatic treatment can be provided to reduce the complications of secondary infections such as, lameness and weight loss due to anorexia. Symptomatic treatment includes local administration of antiseptics, soothing agents, fly repellents, systematic administration of anti-inflammatory agents, antipyretics, and antibiotics to prevent secondary bacterial contaminations. In uncomplicated cases, FMD is self-limiting and may recover in 15 days. The most commonly used antiseptic is a solution of 1% potassium permanganate for washing the hoof and mouth lesions. In addition, a 5% boro-glycerine lotion is topically applied twice daily over the mouth erosions for early healing. Further, nutraceuticals supplements containing Vitamin A, E, and C enhance the healing process. Oral or parenteral appetizers and liver tonic will prevent production losses related to decrease feed intake. Nutritional interventions like soft palatable feed are also required. Throughout the world, FMD control programs are based either on eradication or vaccination. Eradication involves the compulsory slaughter and destruction of infected animals along with restriction in movement. Vaccination and restricted movement are the only feasible measures to prevent and control FMD in our country due to legislation on cow slaughter. The Government of India started FMD control program (FMD CP) in 2004 under the tenth five year plan. This program was implemented in 54 districts of the country, covering 9 states and 1 union territory (A&N islands). Under this program, vaccination cover was provided twice a year with a trivalent (O, A and Asia1) vaccine . At present the FMD CP covers 351 Districts in 13 States and 6 UTs i.e. Andhra Pradesh, Telangana, Maharashtra, Kerala, Tamil Nadu, Gujarat, Punjab, Haryana, Uttar Pradesh, Karnataka, Goa, Rajasthan, Bihar, Puducherry, Delhi, Andaman & Nicobar, Dadar & Nagar Haveli, Daman & Diu, and Lakshadweep. During 2016-17, Rs. 100.00 crore budget was allotted for FMD control, in order to cover FMD vaccination in the 16 states not covered under the FMDCP by the Rashtriya Krishi Vikas Yojana (RKVY). Maintaining flock hygiene and good sanitary practices with vigilant import and export of livestock products are other control measures. Mahapatra M, et al. Antigenic and genetic comparison of foot-and-mouth disease virus serotype O Indian vaccine strain, O/IND/R2/75 against currently circulating viruses. Vaccine. 2015;33: 693-700. Annual Report (2016-17) Department of Animal Husbandry Dairying & Fisheries (DADF). http://dahd.nic.in/sites/default/files/Annual%20Report%202016-17.pdf. Coetzer JAW and Tustin RC. Eds. In: Infectious Diseases of Livestock, 2nd Edition, Oxford University Press. 200.